Ron Swanson, Director of Parks and Recreation is a Pawnee enigma. He adores breakfast meats and Steffie Graf, hates government, has two ex-wives named Tammy, and can carve a harp with his bare hands after 6 shots of whiskey. He's also leading a double life by appearing as the legendary Duke Silver once a month at Cozy's Bar in Eagleton, Indiana. He plays for the mature crowd and evidently has a problem with "walker stalkers", a new term for senior citizen groupies. We got confirmation that Ron is indeed Duke Silver when April called him on it last week. Evidently, her mom has all his albums, although her mom seems a little younger than his typical audience member, one of which said "He makes me feel 60 again." Ron/Duke is playing a dangerous game and is ripe for exposure. He's got a website and someone in the office is bound to discover it. So far, only April and Tom know. Ron was able to buy Tom's silence by keeping his green card marriage secret. April will keep his secret as long as she can sleep at her desk, but what will happen when Leslie finds out she works with a celebrity? 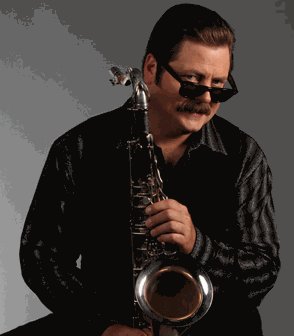 One other question: Did Duke Silver/Ron Swanson design the print on Duke's sax? It is a thing of beauty. 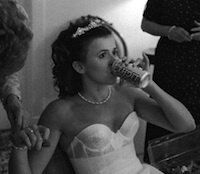 Christa T Palmer was raised in Huntington, WV but migrated west to Denver, CO. Her website bbqcornnuts.typepad.com contains her irreverent thoughts on life and parenting. She divides her time between reading about strange things and watching strange things on television.